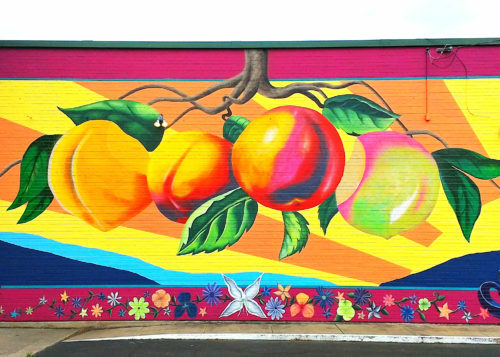 Mural Spotting in North Texas - Number: Inc.
During our bi-annual family visit to the DFW area to show off our recent weight gains and my son’s increasing vocabulary of profane words, my mother in law insisted on giving us a tour of all the recent murals that had been popping up around Denton, Texas. This entailed strapping my grumpy three year old into a car seat, corralling my reluctant husband (who was enabled by his blood relation to proclaim his disapproval of the venture), and squashing myself into the backseat of their stuffy vehicle to drive in circles around town. One thing that has always struck me about painted public artworks is the propensity for drawing giant heads (also known as portraits). Typically these heads are attached to young, beautiful women painted in a style reminiscent of Art Nouveau, but with less charm and more flower power. Another favorite is the dead celebrity head. My question was, and continues to be, why? Why do enormous heads fill people, who have little or no other inclination to spend time gazing at art, with awe? What are the merits of monumental works when one can enjoy the intimacy of small and the audacity of tiny? I felt obliged to rely on my years of interactions with first generation students and the look of wonder they get in their eyes when coming upon a wall sized depiction of Bob Marley. It wasn’t so much a what, but also a how! “How did they do that?” In equal measure, to the degree that people scoff at minimalist or modern work for being something they perceive as being easily replicated by a two year old, they are impressed with the magnitude of the effort involved in creating a mural. It’s just so darn big! I decided that I needed to do some fieldwork and get the layperson’s perspective on mural subject matter by interviewing someone with no background in Art. So, I rolled over in bed and asked my husband, “Why do people like paintings of big heads on walls?” I received a lazy, “Do they?” in return. I assured him that based on the ubiquity of the subject that they must. He helpfully replied, “I don’t think they do.” Dead end. Could I be mistaken? He then followed up with the gem, “I like shapes and colors”. Right. 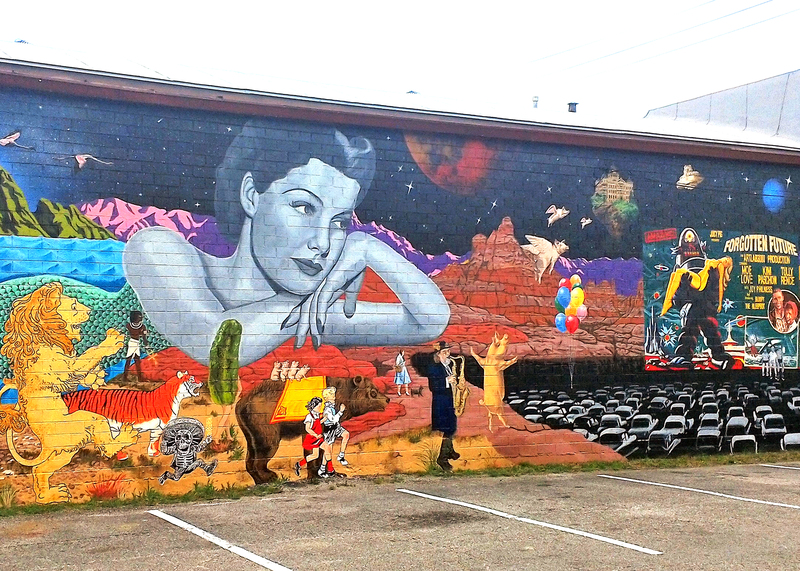 One of the more audacious examples of public art in Denton is the fairly new mural decorating the parking lot of a BBQ restaurant that was recently described as serving “Meh” food by the Dallas Observer. This chaotic collage pairs mythical beasts with dead celebrities and outer space. It offers a sticker book collection of “Stuff We Like.” People pose in front of it because it offers a description and insight into their sensibilities in a way that a public sculpture by David Smith might not. It is friendly and approachable for people who consider art within institutional walls elitist and unwelcoming. By participating in a mural like this, you are donning a persona similar to the one you create when wearing a band t-shirt, swirling with colors and nostalgia. Personally, I dislike artwork that includes celebrity and well-known figures in order to drum up enthusiasm, although there is certainly a precedent for it within Pop Art. The implication is that if you like Marilyn Munro then that regard will transfer to whatever surface she inhabits. However, yet again, I seem to be neglecting the point. This is collaboration between mural painter and average viewer. It is an effortless celebration of the basic non-critical self that is in some ways exonerated from the need to be original, conceptual or challenging. It is Art’s olive branch to communities that otherwise feel confronted, mimicked, mocked, interrogated by Art and its inherent value lies in its ability to reflect a more colorful version of its viewers intended lives. May 31, 2017 Number Inc.